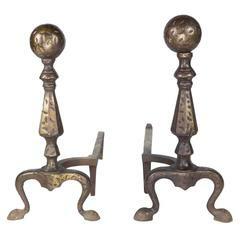 Pair of patinated iron andirons. A pair of hand-forged fire andirons with interesting curved decorations on the top. French, circa 1920s. A pair of hand forged fire andirons with interesting curved decorations on the top. Pair of 1920s American made andirons with heavy patina. Original pair of Art Deco andirons rendered in chrome-plated steel with glass finials. Art Deco style brass fire andirons, circa 20th century. This pair of Art Deco hammered wrought iron and brass andirons is in the style of famous wrought iron maker Raymond Subes. They are French, from the 1930s. Pair of tall cast brass brass Mid-Century Modern andirons.